Hellickson (1-0) struck out six in his first start this season. He was Philadelphia’s opening day starter in 2016 and 2017. “You just have to bounce back,” he said. Rendon has a 10-game hitting streak. He’s batting .474 (18 for 38) with seven doubles, four homers and 14 RBIs in that span. Rendon has an extra-base hit in eight straight. He’s reached safely against the Phillies in 29 in a row, dating to 2017. 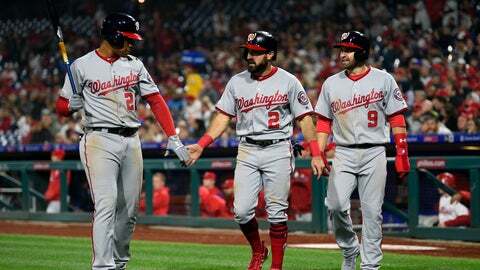 “You just have to ride this wave while you can because you know the lows are coming in a 162-game season,” Rendon said. Nationals: RHP Max Scherzer threw on flat ground instead of a mound because of soreness in his lower right leg after he got hit by a line drive in his last outing. He’s still expected to make his scheduled start Saturday.